Hello, it’s been a while, hasn’t it? I assure you, I do have some DIY projects on the go that will be ready to share with you in the next few weeks or so, but extended work hours, freelance translations and being away from my fabric stash (due to catsitting at clients’ houses and general gadding about) have made sewing and general makery a bit difficult lately. I have managed to do some reading, though! And as it involves travel and textiles – two of my favourite things – I thought I’d share the book with you. As a lover of real indigo, albeit one who knows only a little about it, I couldn’t pass this book up when I discovered it on the shelves at the library. And although I’m only a few chapters in, I’m already glad I borrowed it. 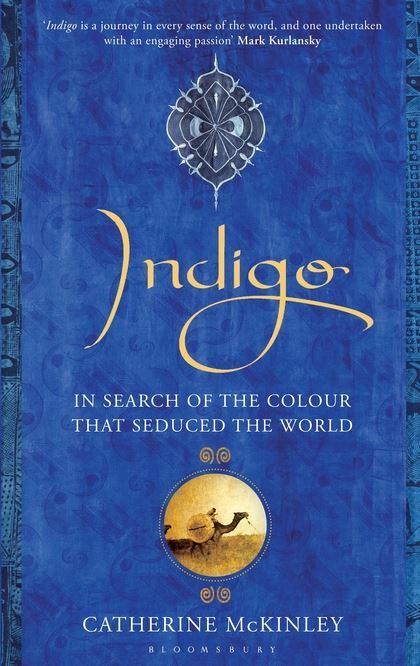 Indigo is about Catherine McKinley’s quest to find out more of the history and heritage of this prized dyestuff which apparently was once worth more than gold, at the same time discovering its links with her own multicultural ancestry. To do this, she travelled to Africa, and I am loving her descriptions of the time she spent in Ghana trying to find authentic indigo (and batik! mmmmm batik…) rather than synthetic factory-dyed versions. It’s the stuff great armchair travel is made of, and I’m enjoying imagining the local women all dressed up in their various prints with mysterious names such as Afa me nwa: ‘You have taken me as cheap and easy as the snail’. So much about this has me in awe – the fact that such a young girl (yes, a girl, back in those days when I’m sure women were usually seen and not heard) not only had the business acumen to cultivate this cash crop, she also was obviously respected enough for her suggestion to be taken on board by (I’m assuming) male cohorts. The fact that indigo was more expensive than rice. That it saved people from insect-borne diseases. That indigo was being used as money instead of paper notes. Are you amazed too? See if you can find this book so you can discover for yourself what makes indigo so special. I still have real indigo dyed fabric from my trips to Laos, and I look forward to making something with it and recollecting the various anecdotes, legends and facts from this glorious book of blue. How timely! I have been having indigo discussions with new friends lately and was just thinking that I need to research the history and educate myself on this wondrous invention. Thank you for sharing. I’ve actually paused my reading because I want to make sketches of the outfits she describes on the streets of Ghana etc as I read! They’re not all indigo but they all sound fabulous.